DONETSK, Ukraine -- Pro-Russian separatists in eastern Ukraine are planning to disrupt the country’s presidential election scheduled for May 25, but Ukrainian officials maintain that the polls will be held. Self-styled governor of Luhansk region Valery Bolotov (C) delivers a speech during a rally to mark and celebrate the announcement of the results of the referendum on the status of Luhansk region in Luhansk, May 12, 2014. For the separatists, it was easy. 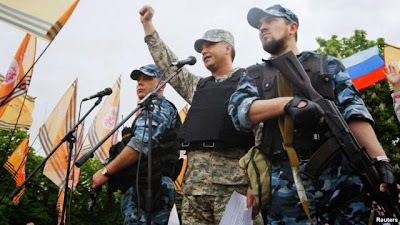 Just nine gunmen marched Wednesday into Donetsk’s main election commission office and declared they were seizing it. With the exception of Ukrainian military barracks, separatist fighters are able to grab most buildings they want in Donetsk province. The police will not stop them; many apparently support the separatists. Others are waiting to see whether the separatists or the government in Kiev will prevail in the tug of war for Donetsk and its neighbor, Luhansk. Meanwhile, the Ukrainian military is stretched thin. The Kiev government and Western powers have denounced the referendums on secession in Donetsk and Luhansk. For Kiev, the presidential election is crucial. It will be the first since pro-Western protesters ousted the Moscow-backed government of Donetsk native Viktor Yanukovych, and it represents a chance to stop the fracturing of the country. In one survey, more than half of respondents across the east said they thought it was an illegitimate administration. The gunmen who marched into the election commission office ordered all workers to leave, saying the election was illegal. Serhiy Taruta, the official regional governor, said Kiev is not losing control of Donetsk oblast, a province with 4.3 million people - 10 percent of Ukraine’s population - and much of its heavy industry. Ukrainian officials insist the election will proceed, except in the flashpoint town of Slavyansk, a hundred kilometers north of Donetsk. That town is totally controlled by the separatists. There are plans for its residents to vote in the neighboring and larger town of Kramatorsk. The advisers spoke on condition of anonymity, as they were not authorized to speak to media. They are anxious also about the security of storage facilities for the ballot papers.